Every now and again, a movie comes along and takes you for a ride you don’t soon forget. It straps you in with its fresh cinematic voice and doesn’t let you go until it has raced through your mind, taken some crazy turns and pulled back into the garage again. When you step out, your legs might even feel a little weak from the constant barrage of thrills and brilliance. DRIVE is that movie. This year’s breakout director, and the winner of the Best Director prize at Cannes, Nicolas Winding Refn, delivers a smooth ride that will catch you off guard at almost every turn and announces the arrival of a new force to be reckoned with on the road. While Refn may be the man behind the wheel off-screen, the man in the driver’s seat on screen is none other than Ryan Gosling. Known only throughout the film as the driver, Gosling exudes an eerie calm no matter how fast his life is moving. There are cars everywhere he turns. He works for a mechanic (Bryan Cranston) and drives stunt cars for the movies. He even moonlights as a getaway car driver for petty robberies and might soon start actually racing his own ride on an actual track. Gosling’s driver needs to be in that seat and subsequently in control of his own destiny. He lives a modest life and never gives anything away on his face, that is until he meets his neighbour, Irene (the always understated, Carey Mulligan). Once their hands touch, on the stick shift of his car no less, his engine starts making noises he’s never heard before. DRIVE is an intense trip and once Refn kicks it into high gear, you can practically feel the rev of the engine emanating from the screen and reverberating through your entire core. It embodies a modern sense of extreme cool, from its pounding soundtrack to its excellent cast (including a deliciously funny, Albert Brooks and a just plain delicious, Christina Hendricks). 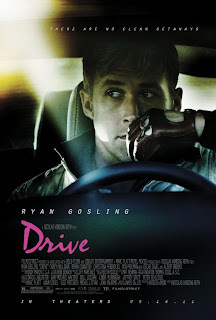 DRIVE is a rebellious film, a night creature, a total badass of a movie. When it gets rough, it goes places I’ve never even imagined, let alone seen on film. And even though Refn pushes the movie into skids of reckless abandon, he is always clearly and confidently in control of the vehicle. By the time DRIVE screeches to a complete halt, you will instantly want to take it for another spin. How many sheep would you give Drive? Not to take anything away from the suave protagonist by Ryan Gosling, but I thought Drive was too sanitized to compete with the greats. A certain level of pulp and filth would have done wonders to the tight plot and confident pace. I can see your point but Drive owns its style and manages to get pretty dirty in the process. It just does so in a hyper organized fashion.